I’ve gone for a British classic dish. I’ve heard the weather’s a tad on the shite side in various parts of the UK at the minute, so here’s one to cheer you all up a bit. 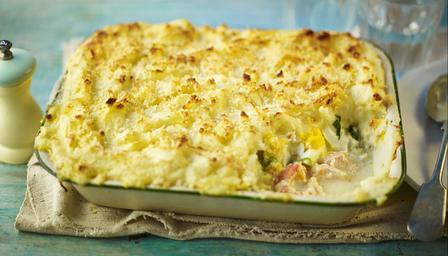 The ultimate in comfort food: fish pie! What I wanted to find was something that was going to be able to cope with both the oaked styles and the unoaked styles that you might have bought. The creaminess of the sauce, the punch of flavor, and the texture and taste of the fish should pair up great no matter which style you’ve gone for. Time to dig out your mum’s/nan’s old recipe cards and have a go. I love fish pies (or really any sort of savory pie in general), one of my favorite things to eat when I visit the UK! me too! just puts a smile on your face doesn’t it? hope you get time to try one with a glass or two this week…. Its fair to say that the new style of Cali Chard is very food friendly – so crisp and fruity, with a touch if creaminess on the finish. Fish pie is a great option – we’re off to do some Sonoma food and wine matching tomorrow so will let you know how that goes!